CAMINU is the International Model of United Nations of Ecuador, and one of the most important in Latin America. It has gained international importance by joining the world’s largest UN model, THIMUN (The Hague International Model United Nations). CAMINU XXIV will be held from November 15 to 17, 2018, at the Colegio Americano de Quito campus. CAMINU XXIV will have the participation of approximately 250 students from national schools. How can I be part of CAMINU XXIV? Those interested in participating in CAMINU XXIV contact Magdalena Nemalceff mnemalceff@fcaq.k12.ec or to our e-mail: caminu@fcaq.k12.ec. For more information follow us on Facebook: /CAMINUXXIV. CAMINU is the result of the vision of the directors committee and all involved in its organization. It was born as an idea of the coordinators of the United Nations club at Colegio Americano de Quito. In April 1995 this idea became reality when students from 14 schools in Quito met in the Tribunal Supremo Electoral of Ecuador in the first Spanish-language model in Ecuador. Now, after 16 years of development, the model has found a specific direction, thanks to its agreement with the National Congress and the support of the Foreign Ministry and the Natura Foundation, through the group in charge of preparing the Ecuadorian proposal for the Johannesburg Summit. 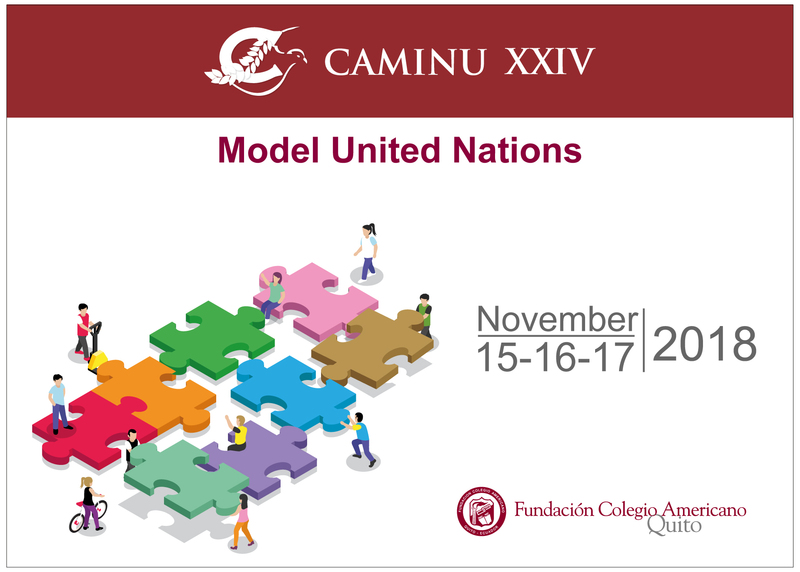 CAMINU has been certified as a member of THIMUN, the non-governmental organization that organizes the largest intercollegial model in the world, THIMUN (The Hague International Model United Nations). Finding and promoting original and feasible ideas to solve the problems that plague the world. Prepare better leaders for the future. Provide an opportunity for cultural exchange, and thus promote the interests of international education through interaction and dialogue between young people of diverse backgrounds and upbringing. Infuse a global perception in young people through the elaboration of peaceful and multilateral resolutions on global issues. Develop communication skills in participants. Promote interest and support for the work of the United Nations and raise awareness among young people about the problems facing the world. Acquire and maintain a level of equality for the participation of all delegates, regardless of differences of origin, training or education. Provide an educational opportunity for youth and adults in the area of international relations.